Dr. Lori Unruh-Snyder suggested that you bring $300 in cash for the trip to use to purchase items that you want to bring back or other things not covered by your trip cost. Meals, lodging, and your airline tickets and included in your trip fee. You will need spending money for snacks and souvenirs so plan your budget accordingly. Taking a credit card is great for those expenses, as they will be accepted there. Just make sure you call your CC Company and let them know the dates you are traveling to Costa Rica. in cash to exchange possibly at the airport for Costa Rican Money (colónes). 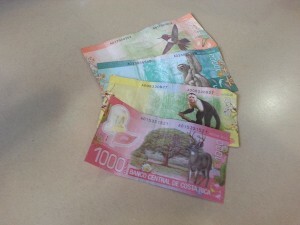 You will be able to spend American money at most every place but having some Costa Rican money will be helpful. We will need to exchange dollars for colones at the airport in Costa Rica – we will coordinate this for everyone. This money can be a part of whatever you decide to bring for your own spending. The total cost per person is around $2100 which includes the plane tickets. Roughly $1500 expenses in country with lodging, meals, activities. Roughly $800 for plane tickets. These are estimated cost. Just wanted you all to have an idea of what the trip actually cost.